This role is for a nearly or newly qualified actuary to join and support the Capital Analysis & Shareholder Assets Teams. 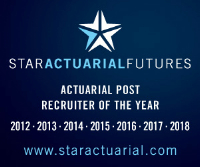 They are seeking a part-qualified or qualified actuary with a good understanding of investment business, and experience of asset classes and data, to join its Investment Strategy team. You will support the team to provide expert views on capital, investment and risk solutions, enhancing or implementing optimisation strategies for our client's insurance customers.